It was difficult on our final morning at Salt Lick to drag ourselves away from the non-stop animal entertainment we’d been enjoying the last couple of days from the window of our room and the verandas of the game lodge. But Oliver, our guide, was determined to take us to see the lions we’d got up close and personal with the previous day. There had been a kill overnight it seemed, and that morning the lionesses had been feasting on a zebra. We drove off in search of pride, but we didn’t have any luck locating them in time as we had another appointment before we had to leave. As Oliver said, “time is not on our side today”. We had been very lucky at the Masai Mara – we had seen all of the Big Five in a couple of days – but at Salt Lick, we had to take on board some of the advice that Edward, our guide at the Mara, had given us: go with an open mind and be flexible, appreciate that every game drive is different and that these animals are wild, not in a zoo, and understand that sometimes we’re just not going to see everything we or our guide had hoped we would. 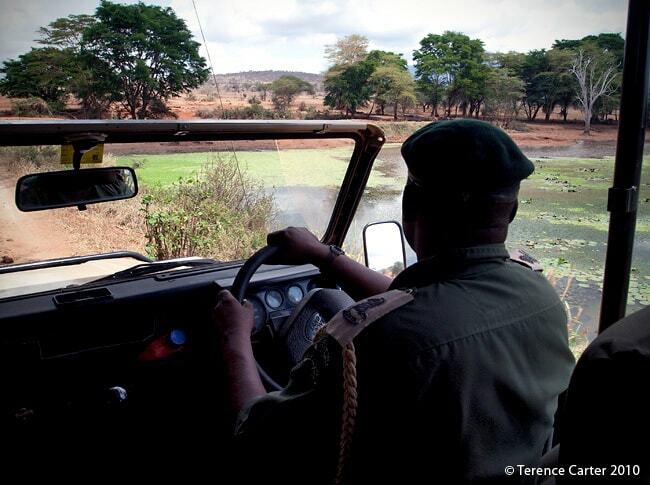 Green Tsavo is an initiative launched by Sarova, in conjunction with the Friends of Tsavo and Futouris, at Taita Hills Wildlife Sanctuary where Salt Lick and Taita Hills game lodges are located. 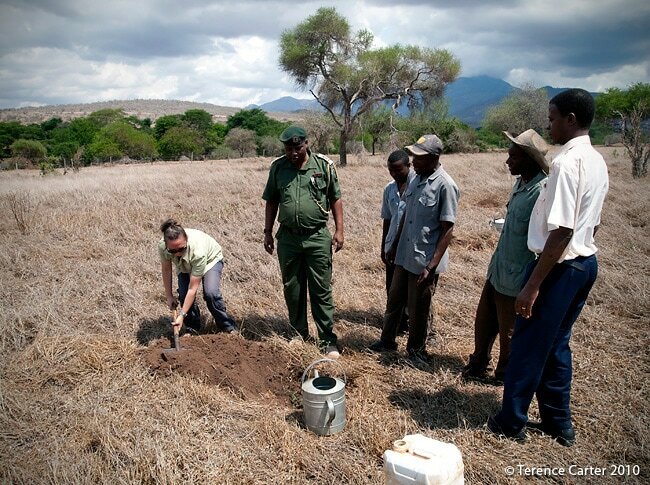 It is essentially a tree-planting project, aimed at enhancing the health of the animal habitat and recovering the biodiversity of the Sanctuary, which lies in an important migrating corridor for wildlife between the northern and southern sectors of Tsavo West National Park. 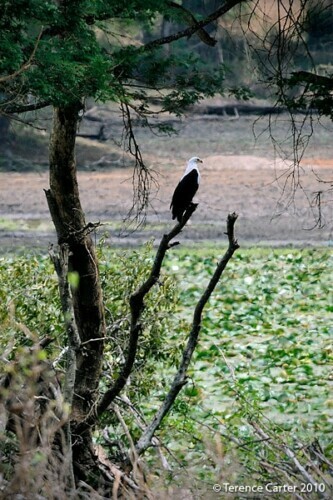 Home to over three hundred and fifty species of bird- and wildlife, including a number of endangered species, the wildlife conservancy lies within an area identified by UNESCO as a biodiversity hotspot of immense bio-geographical importance. 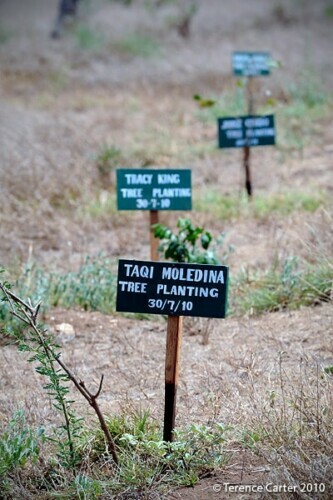 Guests who stay at either of the lodges can adopt a tree for a small amount. 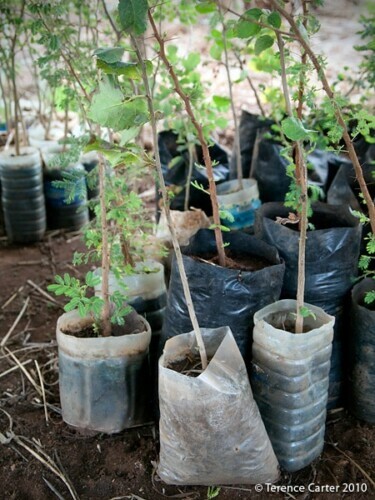 You’re not only helping the environment but also the local communities as Sarova commissions locals to grow the seedlings, which Sarova buys from them. You get to choose your tree from an array of seedlings native to the area, you get to plant it, and if you arrange it in advance or you stay long enough, you can even get a photo of yourself taken with your tree identified by a sign with your name on it. 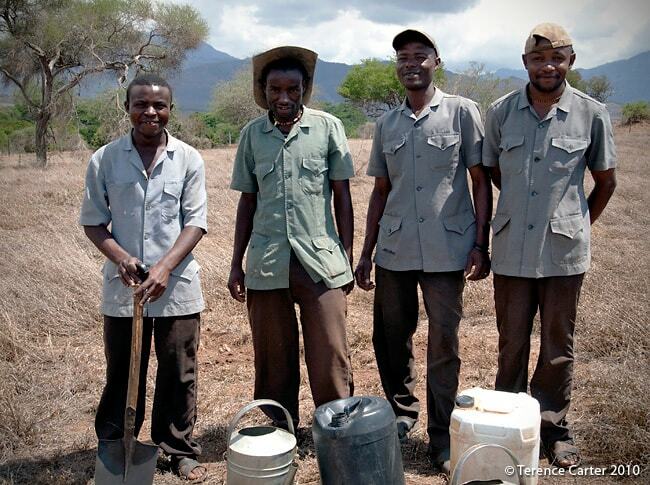 We would have been happy to adopt a Grantourismo tree, but Willie, the lodge manager, had made a gift to Terence and I of two seedlings of Acacia tortilis, the umbrella trees which the giraffes love to eat. We were thrilled to bits as we love the trees and we also love giraffes. 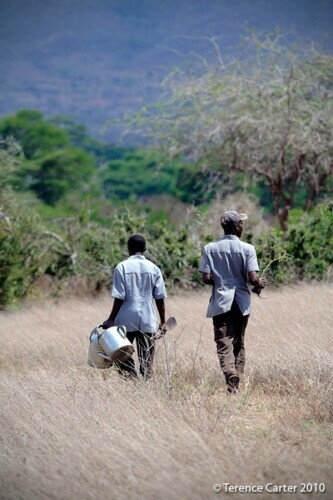 We trudge up the slope with Oliver and Ephantus, the assistant lodge manager, who tells us that these 35 acres of land were barren just one year ago. 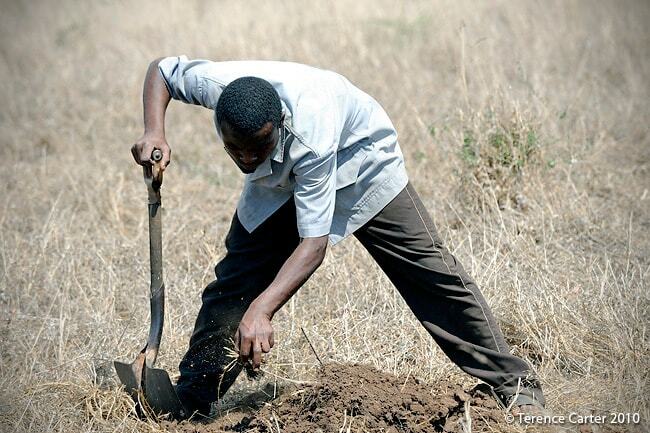 Now, there are 3,000 seedlings growing here and Sarova’s goal is to plan one million. When we arrive at our spot, a few of the gardeners have just finished digging our holes for us (only because we’re in a hurry!) and in a rather sweet little ceremony accompanied by a local celebratory song, your two hot and sweaty grand tourists each shovel dirt back into the holes around our little trees, and pat down the dirt to ensure the earth is nice and firm, and our trees will survive. Very jealous of you two. Sounds like you are having a fantastic time. Great post. You have a gift of writing, that is for sure. I wish I could tag along on all your adventures! We are, thank you! But look where you’re reading from! What a beautiful spot! 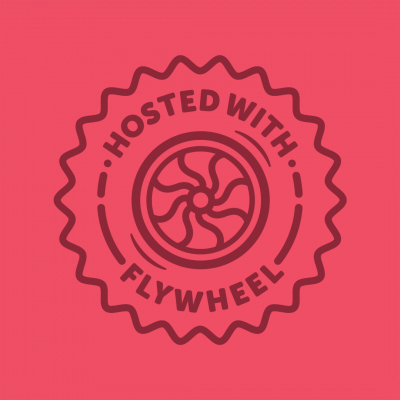 Loved finding your blog. 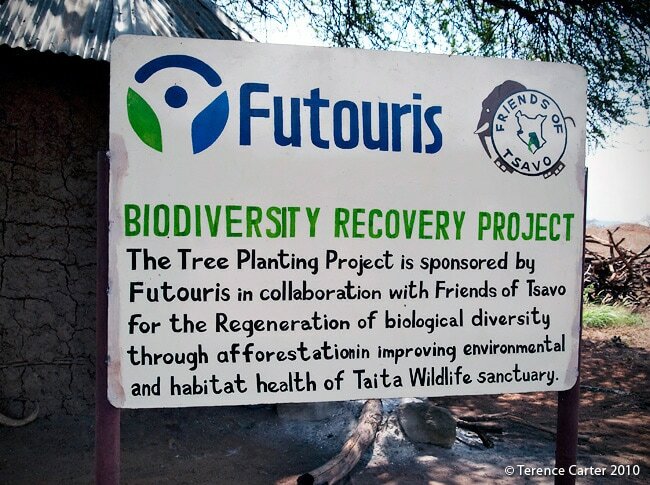 Just back from Kenya myself and have planted a tree with the Futouris Trust too. My father died 8 weeks ago and with the money bequeathed to me, I and my husband Mike vivited Kenya. I have dedicated my tree to my dad ( who loved all wildlife and nature ). Its amazing to think that his tree is going to support the amazing landscape and all the creatures that dwell there. Hello Jacqueline – I’ve just seen this comment of yours, please forgive me for overlooking it. So sorry to hear about your father, but pleased to learn you visited Kenya and planted a tree for your dad – what a thoughtful thing to do.